Signs such as this sign on a private association beach on Long Island Sound litter the Connecticut shoreline. Legally, all people have rights to be on public beach, which is defined as the area below the mean high tide mark. This area is marked by debris, driftwood and seaweed. There is dry and wet sand. The Connecticut shoreline is nearly all privately owned. The landowners are well-to-do. For ages they have blocked access to the intertidal zone and trespassers were prosecuted. Inner city kids couldn't experience the beach without paying exorbitant fees. They could go to the crowded and commercial state beaches that were not free. In the 1970s Ned Coll, a political activist in Hartford, agitated and won access to the public beaches by walking the high tide mark from Stonington (on the eastern end of the Connecticut shore) to Greenwich (on the western end). Yet forty years later, there are still squabbles about how one is able to get to these public lands. 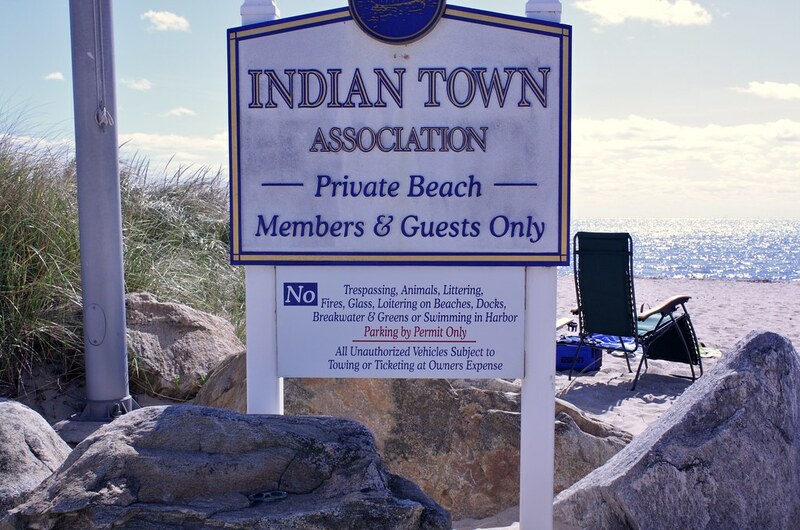 A July 2009 article, Public access to the shorefront not always easy, in connpost.com, explains the various ways different shoreline towns restrict access to public land. The State of Connecticut makes the law very clear in the Connecticut Coastal Access Guide. Yet it is nearly silent about how one should get down to the public land. Signs such as the one I photographed show that the conflict is still going on. I am old enough to remember the court fights and Ned Coll's march. I am so disappointed with the hostility and exclusivity that this sign represents. Good post! The article you mention from July was very good as well. From my experiences, Greenwich gets a lot of the bad press, but there are many towns that are just as guilty. The stretch between Branford and Saybrook has very limited access. Thank you Matt! I love your blog(s) and have been perusing. I will be visiting often.